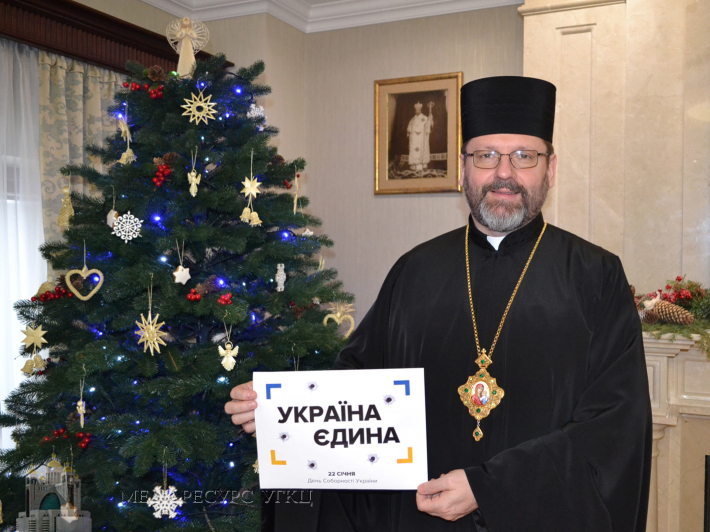 The Father and Head of the Ukrainian Greek Catholic Church His Beatitude Sviatoslav joined the IV international flash mob "United Ukraine" before the Day of Unity of Ukraine, January 22. As mentioned the organizers, the aim of this flash mob is to focus the attention of international community to Ukraine, to the fact that though a war has been going on for four years, our nation is adamantine and united, and resists the Russian aggressor with dignity. In the commentary to the UGCC Department of Information, the Primate noted that this year, as well as yearly, on January 22, Ukraine is going to celebrate the current anniversary of the Act of Unity, which meant the unity between the Western Ukrainian People's Republic and the Ukrainian People's Republic. This took place on January 22, 1919. "This holiday has a deep historical meaning which is very significant for us today because Ukrainians had achieved the age-old desire to live together and build the united Ukrainian independent state. And this event is important to us today because similar challenges we face nowadays," said His Beatitude Sviatoslav. According to the Head of the Church, today there are many people who would like to disintegrate and tear Ukraine apart, impose on us another state order which would contradict the idea of unity. "Various regional antagonisms are now emphasized. And our politicians use these differences in order to contrast one part of the country with another in their political goals. That is why, I believe, the Day of Unity of Ukraine must be celebrated in order to reiterate that both in our church and social life we must put things which unite us over those which separate," underlined His Beatitude Sviatoslav. His Beatitude Sviatoslav persuades that we must call all our citizens, all our faithful and especially our state leaders to work for strengthening unity: the unity of our thinking, the unity of state building and responsibility for our country, the unity of political process because only united Ukraine is the guarantee of our better future. ***In 2017 in the flash mob "United Ukraine" participated over 12 000 people from 63 countries, including the governor of Ohio John Casich, members of European parliament Corazza Bildt and Valentinas Mazuronis, US Congress woman Marcy Kaptur, ministers, members of parliament, leaders of the Ukrainian diaspora, church leaders, famous cultural and public activists.